BLAEU - Africae nova descriptio. BLAEU, W. - Africae nova descriptio. Africae nova descriptio. 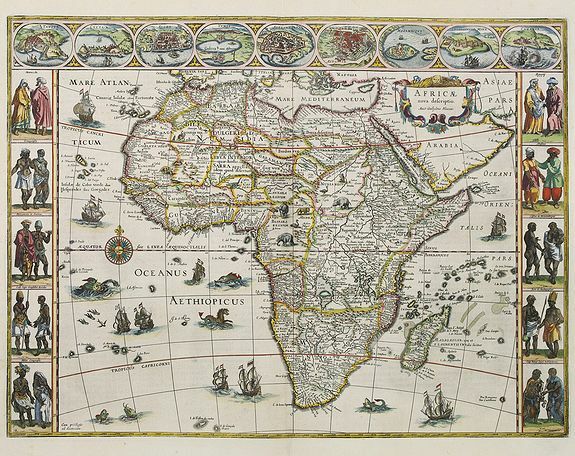 - BLAEU, W.
Title : Africae nova descriptio.. Size : 16.1 x 21.8 inches. / 41.0 x 55.3 cm. Description :Much of the geographical information is still based on the Ptolemaic maps, with the Nile shown with its source in the Lakes Zaire and Zaflan. Also included are various other mythical lakes and rivers including the famous Lake Sachaf of Laurent Fries. Only coastal towns are named on the Cape, with the printing covering much of the Unknown territory. Decorated with elephants, lions, ostriches etc. on the land areas, and ships and sea monsters on the sea. With columns on either side depicting ten views of the native manner of dress and nine city and town plans above.